It’s been an ongoing joke onboard Persistence, our C&C34 that we have had for nearly 4 years that “this would be great for the blog.” So here it is, a few years late but not too soon, a blog on the adventures of two 30-something sailors and their little dog, Scruffy. 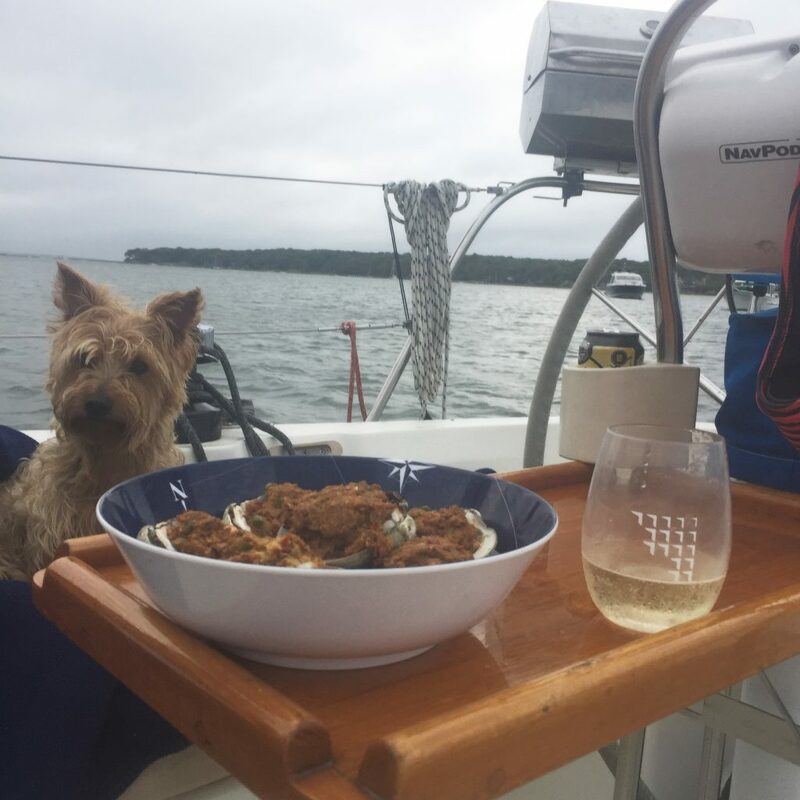 I start this blog sitting in a bean bag chair with a glass of white wine left over from a dinner party on board last weekend back in our home port of Jamestown, Rhode Island. I am looking at the sea wall of Sag Harbor, NY. Scruffy, our 8-year-old Silky Terrier, is snoozing in his bed behind me in the shade of the boom. He likes to make himself comfortable. Brandon just got back on board from a swim/snorkel where he found a couple of scallops. I plan to cook those up with butter and garlic tonight with a little more of that white wine for dinner. This is our first time cruising to Sag Harbor and Long Island. 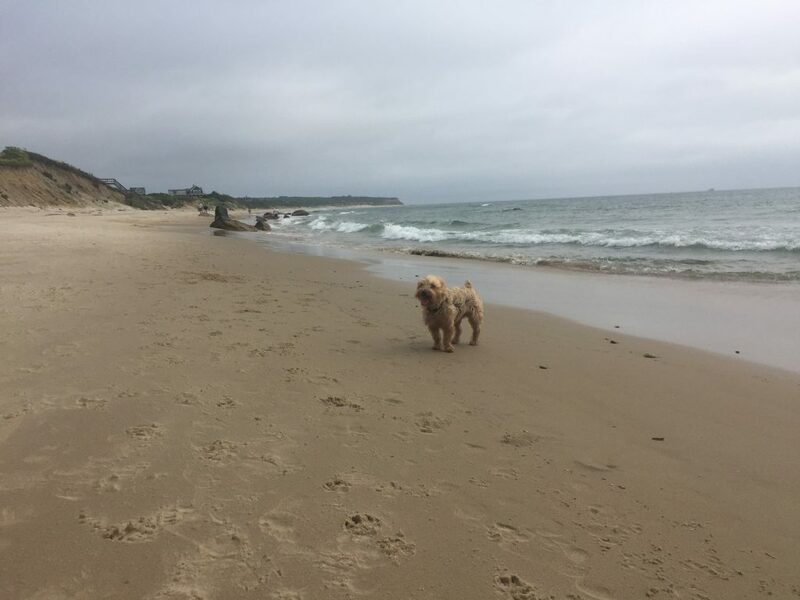 We have taken a mini 4th of July vacation to find new places to cruise and thought given our 5-day break, we’d venture beyond our usual Block Island and Cuttyhunk 20 mile jaunts and go a little further. 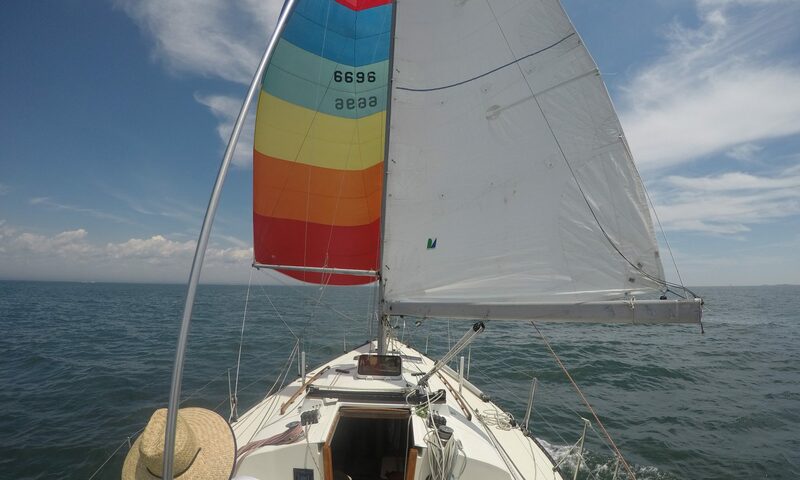 We left Narragansett Bay on a whim on the evening of Thursday, June 29th. Our plan was to try and leave early Friday if the forecast was right as it was looking to blow from the Southwest and Long Island is exactly south and west. The backup plan was to just turn downwind and head to any of the Elizabethan islands. We accepted full well that everywhere would be crowded for an extended 4th weekend. However, after sailing myself on Thursday as part of a weekly J24 series in Newport. The wind was down so we decided to “send it” to Block Island go get a jump on the projected wind. 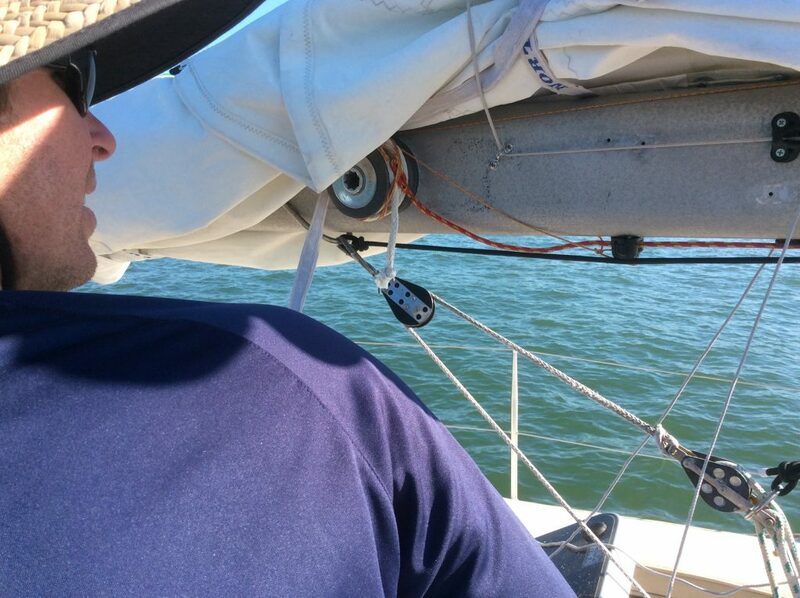 The boat was already provisioned so Brandon scooped me right on the docks of Sail Newport around 8 pm and off we went. 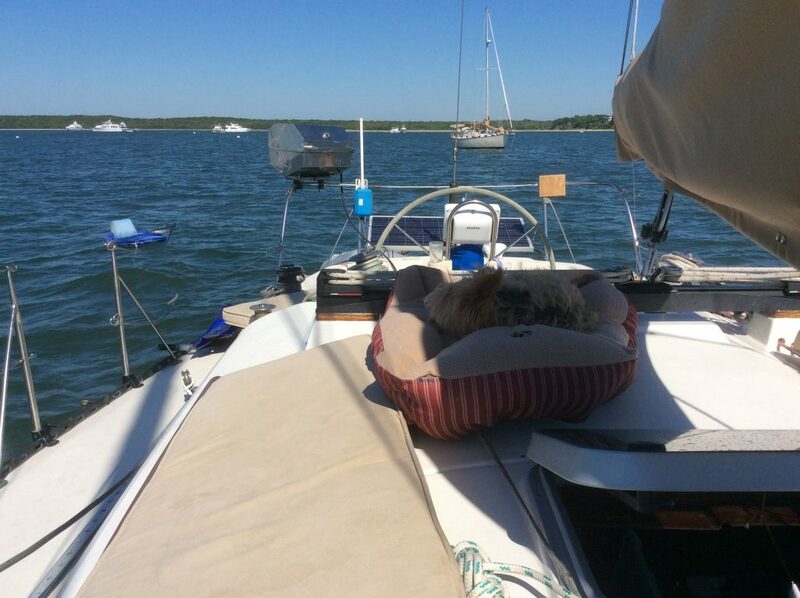 Scruffy loves the boat….Most of the time… It took hugging him the entire way to Block Island coupled with a half of a doggy anxiety pill to get him there. By 2:00 am we were pulling into the Great Salt Pond. Luckily, for us we have been here countless times, I even lived here most of my college summers, so we are comfortable in the anchorage. We actually found a private mooring and assumed no one was coming to grab it at that time of night. Once we were settled, both of our sea sicknesses immediately dissipated. Of course, cruising with a dog means sleep is still a dinghy ride to shore and back away. By 3 am, it was finally lights out. Friday morning we didn’t get up until nearly 11 am, I felt hungover from the seasickness. We are fortunate to have a dog with a camel’s bladder so it wasn’t until nearly2 pm after I made breakfast bowls of eggs, sausage, onions, peppers, beans, and avacado that we made it ashore. It was still blowing well over twenty knots so we decided to stay another night instead of trudging upwind again. My parents gave us folding bikes last Christmas so we loaded those for the first time in the dinghy. They fit perfectly in the sail bags for our main and jib as not scratch the floor boards and bodies. 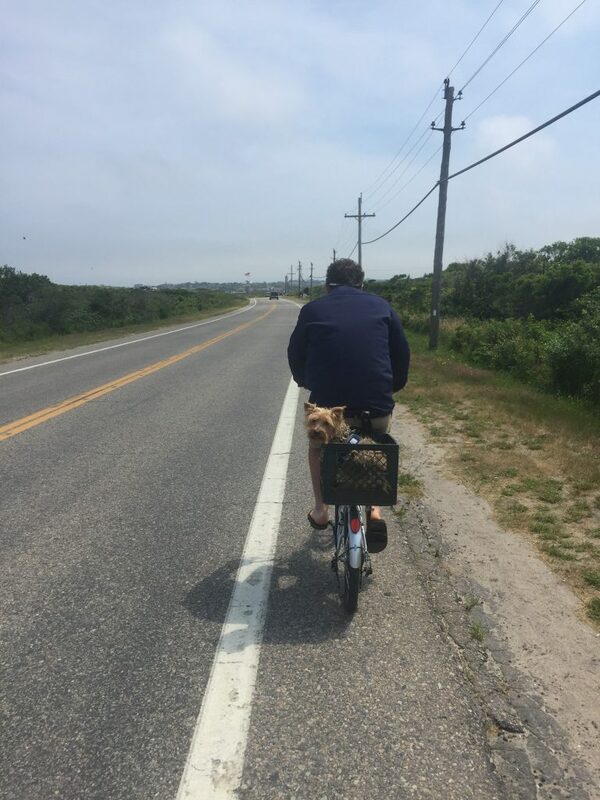 We went to shore, put scruffy in the milk crate we affixed to the back of Brandon’s bike and headed to town for errands. Brandon needed a hat as we left in a hurry and his was in the car. I also left my sunnies on the J 24. Then we headed back to the boat around 5 pm, we were both still exhausted from the adventure the night before, so we took naps then arose 8 pm8pm to have some gourmet dinner of Annie’s Mac and Cheese with some leftover chicken. We took Scruffy in for one last relief then promptly went back to sleep. All in all, we did a lot of sleeping on Block Island but it was grey and windy, so what else is there? We woke up leisurely on Saturday and I made blueberry pancakes, took Scruffy to the beach to tire him out before heading out again. the wind was down to 15 knots now but we decided to head towards the forks of Long Island which would be a close reach. The funniest part of our dog walk was Scruffy was thirsty and we found a half filled water bottle. I opened and took a whiff, it was Bacardi… I almost vomited on the beach. We left around 11am from Block and headed 270º W to Shelter island. It took us 5 hours to go 31 miles which is great for us. We had a reef in the entire time. The wind would go from 17 down to 12 and the sun would peak through just long enough to get our hopes up before disappearing again. 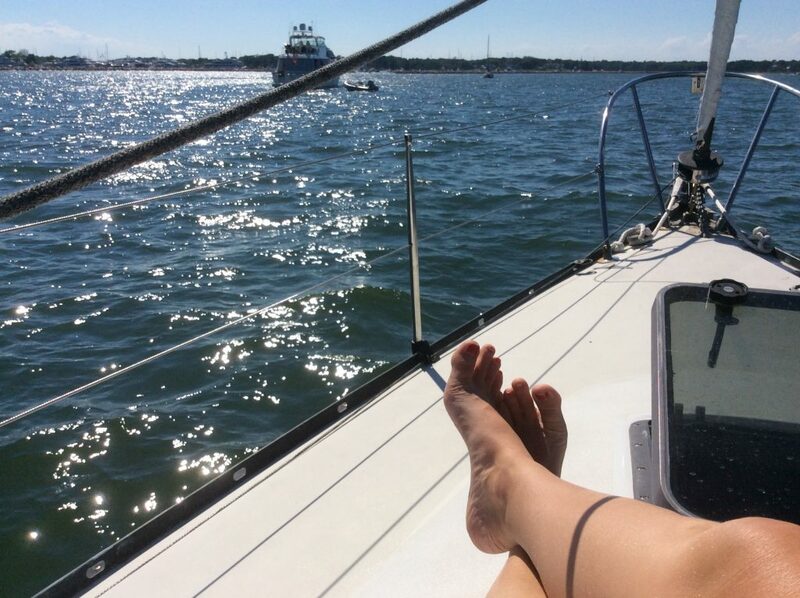 We anchored in Coecles Harbor on Shelter island around 4:30 pm. The cruising guide informed us that this is one of two allowed anchorages on the island. There’s nothing here but an anchorage. The land is a nature conservancy for birds so kept to the shoreline to walk Scruffy. That night I made bruschetta as an appetizer with Gin and Tonics made with my favorite gin, Barr Hill gin from Vermont. For dinner, we had boat stuffies. Brandon dove in Block Island next the boat and I kept them In the fridge. To mKe them, we fire up the grill and put them in cold. You keep an eye on them and as soon as they open, you dump the clam juice in a bowl and shuck out the meat. I cooked up some onions, garlic, peppers, and sun dried tomatoes down below the. Mix the juice, clam meat, cooked veggies, bread crumbs, paprika, worchestire sauce, and a little cayenne pepper with an egg to make the batter. Then I put the batter into the shells in the boat oven for however long it takes to drink a G&T. When they are just crispy on top, grab a fork and eat em up. No hot sauce needed, the cayenne is just the kick to balance the salty brine. 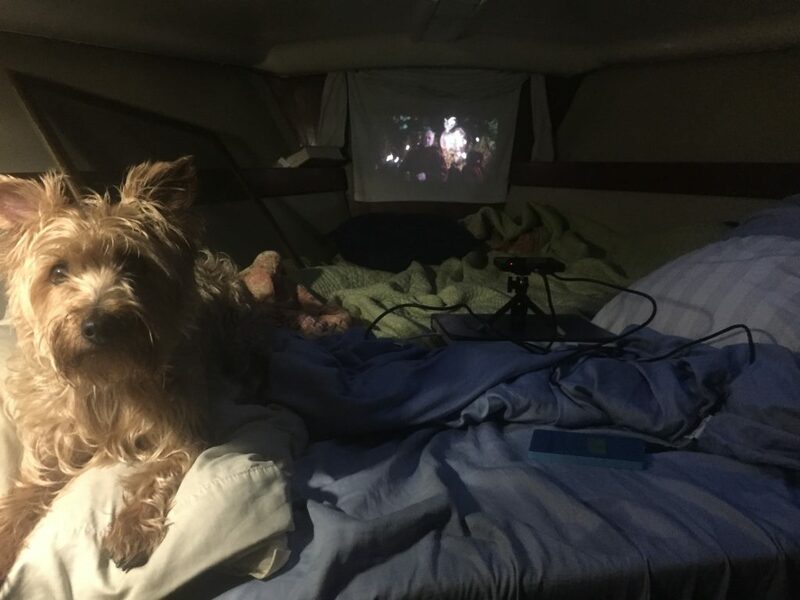 After dinner, we turned the V-berth into a movie theater. We have a mini projector that can connect to an ipad and using a white shirt, we can watch House of Cards all night long. However, once all three of us snuggled and got the Netflix going (I downloaded it prior) we were asleep before the opening credits were over. I awoke around 8 am on Sunday to blue skies and calm wind! Something we hadn’t seen since Thursday. I love cruising but my biggest peeve is when everything is just a little moist. So when I woke up to dry conditions, I got everything clothes pinned to the lifelines to dry. A dry towel can make all the difference on board. I brewed up some coffees and we took Scruffy back into the Nature Conservancy shore walking him North around the spit that makes the channel. I wish I had my camera because the little guy just laid down in the water for a while like a mermaid. I called him a mer-dog. 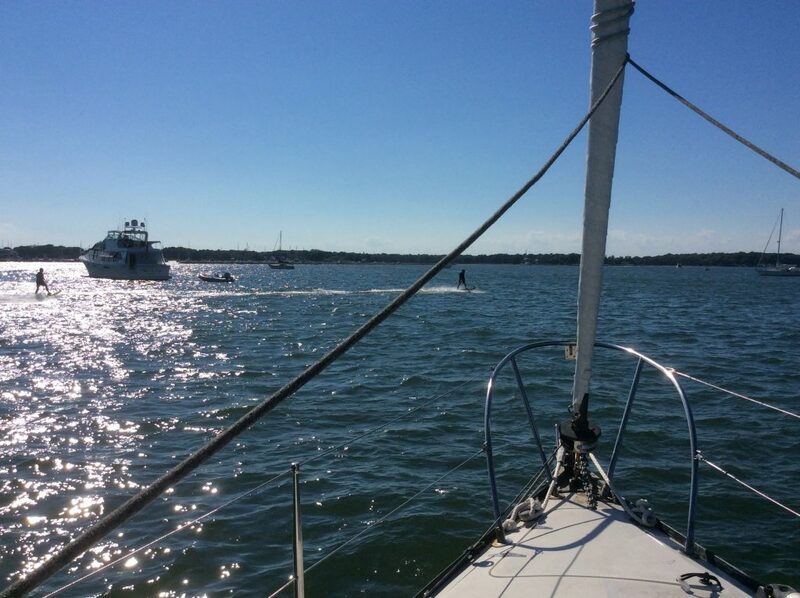 We headed back the boat and soon after setting sail for Sag Harbor just 5 miles away. It was a light westerly which made for a lovely Sail. We anchored outside the break wall next to one of Brandon’s customers, a Swan 53 called Auroa. Francesco, the owner, came over to say hi. 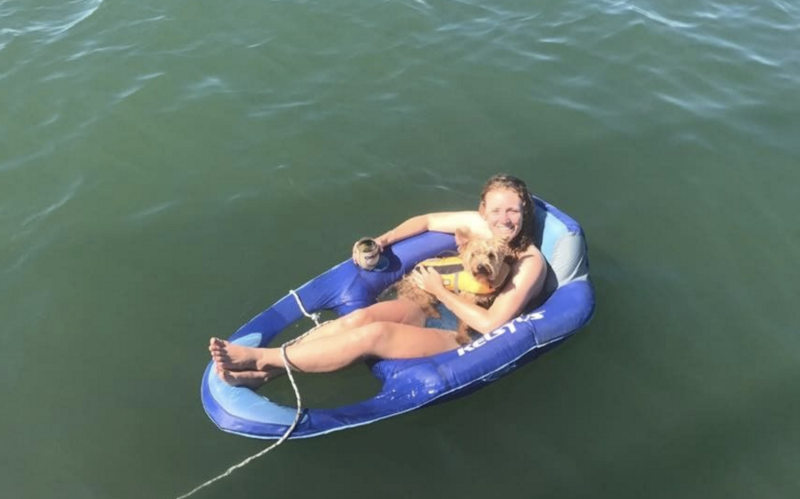 Poor Scruffy was so excited to see him that he fell overboard as he wagged his body so hard as he approached by dinghy. Aurora broke free of her mooring last fall here in Sag Harbor and ended up on the sea wall so we have gotten to know Francesco this winter as his boat was at the yard getting repairs. He invited us on a sail, but having just arrived, we decided to go ashore to check out Sag Harbor. We loaded the bikes and Scruffy once again and docked on the town docks. We biked around a little to see the homes. My dad texted me the night before and said “you’d like Sag, it’s quiant.” He’s right. Like I mentioned, having the bikes are great because they extend what is possible while cruising. Last summer, we went to Fishers Island for a weekend and we were stuck walking within a mile or so of where we landed. If you’ve ever even to Fishers, there’s not much within a mile of the Yacht Club. That is when we thought bikes would be helpful in our pursuit of exploring the places we cruise. So thank you, parents, for these great Christmas presents! We are also thankful our little dog puts up with all our adventuring antics. We affixed a milk crate to the back of Brandon’s bike and lined it with a towel, attached a harness, and off we went. We practiced last weekend in the neighborhood first to make sure he could handle it. He basically just sits in it and sniffs the air. After I got out, I decided it was about time to start this blog. So if you have read this far then you are a true friend. I’m now own to Rosé and Brandon has rigged us new jack lines. I have also been watching these crazy skimboard/ jet skis/ don’t-know-what thingies flying around us. See photo. Now I’m off to make scallops and pasta. The plan is to head to Fishers tomorrow on our way home.